Nice article about Cassidy and her last high school season. Didn't know that Dana gave Cassidy her gold medal from 2013 Worlds -- go, Bears indeed! The TYR Pro Swim Series in Atlanta is this weekend, but this time, only one baby bear is swimming - Cassidy! Looks like Cass had pulled out of this meet? Tonight we saw SoCal's Elise Garcia swim a 53.62 in the women's 100 fly ahead of GSC's Anicka Delgao (53.84) and Zephanie Koh (54.62). CITI's Alexandra Crisera (53.72) and NOVA's Ayla Spitz (53.75) went 1-2 in the women's 100 back with Samantha Pearson swimming to a third place finish in time of 54.46. SoCal's Samantha Shelton was the only woman to dip under the 2:00 mark in the 200 IM by going a 1:59.40 with NOVA's Ayla Spitz just barely above in 2:00.49. Justina Kozan touched third in a time of 2:02.09. 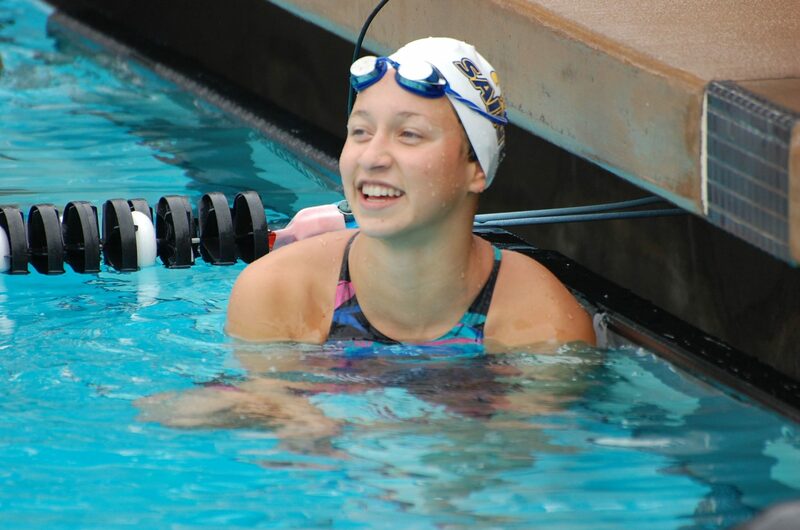 Not sure if 2019 Cal commit Chloe Clark was sick or something, but the top seed in the 100 Back swam 3.72 sec slower than her seed time (56.95) to finish 16th @ prelims, opted out of her 200 IM's morning heats, and didn't return for finals...hope Chloe will make a swift recovery if it was a health issue! AW has actually recorded a new personal record this year, back in Feb.
2:04.15 in the 200m Free, which roughly converts to a 1:48.96 in SCY. Previous best was a 2:04.94 from the 2018 Austin PSS in Jan, which itself was a massive 2 sec+ drop from her old lifetime best of 2:07.00 done back in March 2017! Bears probably still need an impact international recruit or transfer to put then over the top in 2019. A distant oriented IMer (MSH) would be ideal to break up LSJU points. "First of all, cheers for your beary nice scoring contributions to the team & school @ 2018 NCAAs, well done!! Oh, and btw please let your photographer below (i.e. MSH) know that her brightest future, swimming & otherwise, truly lies with the Golden Bears, rather than with UofT or going pro... "
Oh snap! A Canadian pipeline would be awesome! Looks like UGA has a transfer for next year...Sofia Carnevale. Sofia: "I'm very grateful and super excited to announce my decision to transfer to the University of Georgia! Thank you UNLV for the past two years and to all of my friends and family for the support GO DAWGS"
She's a sub minute breaststroker, which may or may not solve their breaststroke problem (which is more of a problem for them than for us - they had to resort to using IMer/Freestyler Meaghan Raab, who did put up an admirable 1:00 split for them) She was a sophomore at UNLV last season. Some more major transfers for the 2018-19 season. Andison is a strong IM/breaststroker, Forbes a back/flyer. Ema Rajic: "pelican squaaaa is going off to college #stanfordsucks #gobears #allgrownup"
I found some information regarding the one uncommitted recruit we are waiting for word on: Sarah Grinalds. "Warde is always an awesome meet, there's so much competition," said Grinalds, who has visited Texas, Virginia, Florida, Harvard and Princeton and expects to make her college choice within the next month. "The energy was great today. The place was shaking. I am upset that I missed so much time, but now that I'm back, I feel like I almost never left. Everyone's been great to have me back swimming again." This article was posted on Oct. 26th, 2017. Well, it looks like she won't be expected here at Cal (unless something magical happens). Congrats to all, and Go Bears! USA Swimming has announced rosters of its top 18-and-under talents to compete at the Mel Zajac International Meet and the Mare Nostrum tour in June. The Mel Zajac roster is for high school athletes who have never previously represented the United States, while the Mare Nostrum group is pulled from last year's 18-and-under International Team. The Mel Zajac meet will take place in Canada (University of British Columbia, Vancouver) from June 1-3. The Mare Nostrum team is about half of what USA Swimming calls its "18 & Under International Team." That group qualified last year, with the requirement to post a minimum top-50 world ranking for women or a top-75 world ranking for men. The 18 & Under International Team then had a choice of traveling to two World Cup meets last fall (Tokyo and Singapore) or attending two of the three stops on the Mare Nostrum tour in mid-June. Specifically, the half who chose Mare Nostrum will compete in Canet-en-Roussillon, France on June 9-10 and Barcelona, Spain on June 13-14. Preliminaries for the 2018 CIF-Southern Section Division 2 Championships went off on Friday in Riverside, with finals slated for Saturday morning beginning at 11 am. The Division 1 Championships, taking place in the same complex, had their prelims on Thursday with their finals set for Saturday afternoon. Also having impressive showings for the girls was Crean Lutheran senior Elise Garcia, Trieu, Treydte, and Foothill's Samantha Pearson. Despite seeing her 50 free record fall, Garcia had a very strong session by taking the top seed in both the 50 free and 100 fly. She went 22.82 in the 50 free, with teammate Mandy Brenner sitting 2nd in 23.28. She holds a massive advantage in the 100 fly, sitting 1st with a 53.26 while Redland's Autumn D'Arcy is back in 2nd at 54.98. After Crisera was the big story on Friday, it was Elise Garcia of Crean Lutheran and Emily Trieu of Los Osos who were the big performers on Saturday, each earning two individual wins. Garcia started with a win in the 50 free, touching in 22.71, with teammate Mandy Brenner maintaining her runner-up position in 23.37. About 25 minutes later Garcia dipped below the 53-second barrier in the 100 fly, winning by a landslide in 52.92. Autumn D'Arcy of Redlands took 2nd in 54.78.
it was Elise Garcia of Crean Lutheran and Emily Trieu of Los Osos who were the big performers on Saturday, each earning two individual wins. Garcia started with a win in the 50 free, touching in 22.71, with teammate Mandy Brenner maintaining her runner-up position in 23.37. About 25 minutes later Garcia dipped below the 53-second barrier in the 100 fly, winning by a landslide in 52.92. Autumn D'Arcy of Redlands took 2nd in 54.78. Crean Lutheran went one-two in the 50 freestyle. Senior Elise Garcia came up shy of her own meet record, but finished first in 22.71. Cal bound Garcia hopped right back up to win the 100 butterfly with a quick 52.92. In analyzing the consolidated results of the CIF-SS Championships, bringing together divisions 1, 2, 3 and 4, it becomes clear that the top division isn't as dominant over the others as say, at the NCAA Championships. 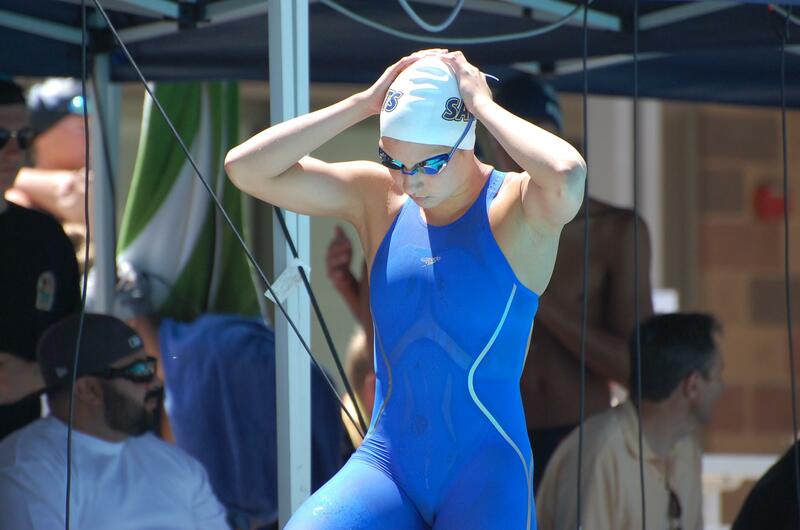 Elise Garcia of Crean Lutheran, Danny Syrkin of La Canada and Andrew Koustik of Calvary Chapel-Santa Ana all had spectacular performances at the D2 Championships to post the top times of the entire Section in both of their individual events, with Garcia tying Santa Margarita's Anicka Delgado from D1 in the 50 free. 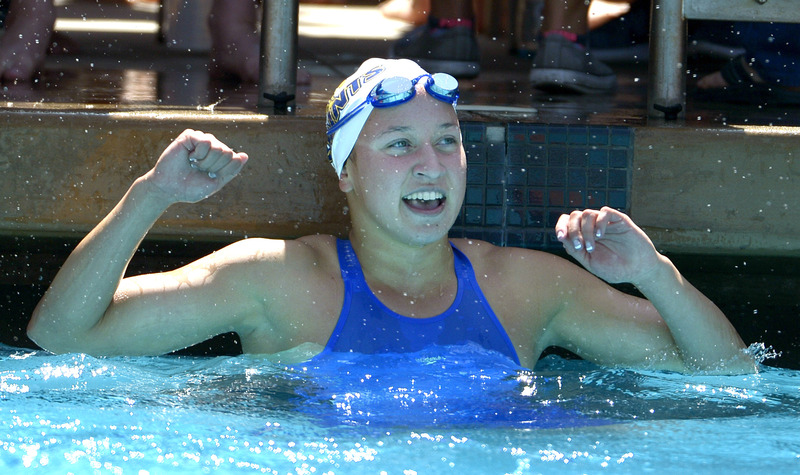 Alexandra Crisera, who holds the top time in the 100 free, actually led off her team's 200 free relay in a time that was faster than Garcia and Delgado at 22.59. Many California high school swimmers will tell you that their section meet is more important than their state meet. So much so that many skip the state meet altogether. There are various reasons for this, with many cases simply being that swimmers' club coaches just want to get the long course season underway. This kind of robs us of seeing a head-to-head, best-on-best showdown of the best swimmers in the state. Despite this, there's no need to worry, as John Neff has provided us with combined results from all of the CIF section meets. This, theoretically, gives us a glimpse of what a state championship meet might look like with everyone in attendance. In terms of which section was the fastest in terms of #1 time and not necessarily depth, the Southern Section girls led the way with seven top times out of eleven events. This included a 1-2-3-4 in the 200 free, a tie for 1st in the 50 free, and a pair of 1-2s in the 100 fly and 100 back. Individually, Elise Garcia (Southern Section) and Zoie Hartman (North Coast) each had the top time in two events. Below, check out full top-16 results, combined from all CIF section meets. *Note: times do not include relay lead-offs or prelim swims. Only finals. 2018 Pro Swim @ the IUPUI Natatorium in Indy next week, 16-19 May. UMich commit Alexis Wenger decommits from Michigan and commits to UVA for their 2018 class. COLORADO SPRINGS, Colo. USA Swimming and TYR are proud to recognize the TYR Next Gen Team honorees from the Indianapolis stop of the 2018 TYR Pro Swim Series. At each stop of the 2018 TYR Pro Swim Series, the top performing 18-and-under Americans in each Olympic event will recognized as a member of TYR Next Gen Austin, Atlanta, Mesa, etc. The members of the team will be recognized on usaswimming.org and will receive a special DeckPass Patch. Her short course times aren't worth ranking #1 on this list, and they haven't improved since we last ranked this class. So why is Ruck our new #1? Mainly because she's focused entirely on long course meters swimming without a single yards swim since last year's ranks. And she's seem immense improvements, with world-class times too good to ignore. Think 24.2/52.9/1:54.8/4:09.9 in long course freestyle and 58.9/2:06.3 in long course backstroke. If she even comes close to that level of production in short course yards, she's the best swimmer in this class by a wide margin. Bartel enters the NCAA with breaststroke times that would have taken 4th (200) and 5th (100) at last year's NCAA Championships. Add to that an incredible IM drop (1:58.2 to 1:55.7 since our original ranks) and Bartel has three NCAA scoring times and essentially the best time in the entire class in her three best races. Her freestyle upside (that 200 is shockingly good, and has dropped from 1:50.4 since our first ranks) is just a bonus to already-elite relay value through her breaststrokes. Cook is easily the fastest riser in the class. When we first ranked, she had four events on the cusp of NCAA scoring, but none good enough to take home points. Now, with solid improvements in all three, Cook has four NCAA scoring times, more than anyone else in the class. She took more than half a second off what was already the class's best 100 free, took over the top 100 back time and is within tenths of being the best swimmer in the class in the 50, 100 and 200 frees plus the 100 back. Talk about a relay weapon. The best IMer in the class, Pearl remains high in our ranks. She made solid but not eye-popping improvements in all of her best events besides the 200 IM, where she surged from 1:58 to 1:55 since last spring. She's not far off an NCAA A final time in the 400 IM and 200 breast, too, and has potential to be a multi-event scorer (and big scorer) right out of the gate. 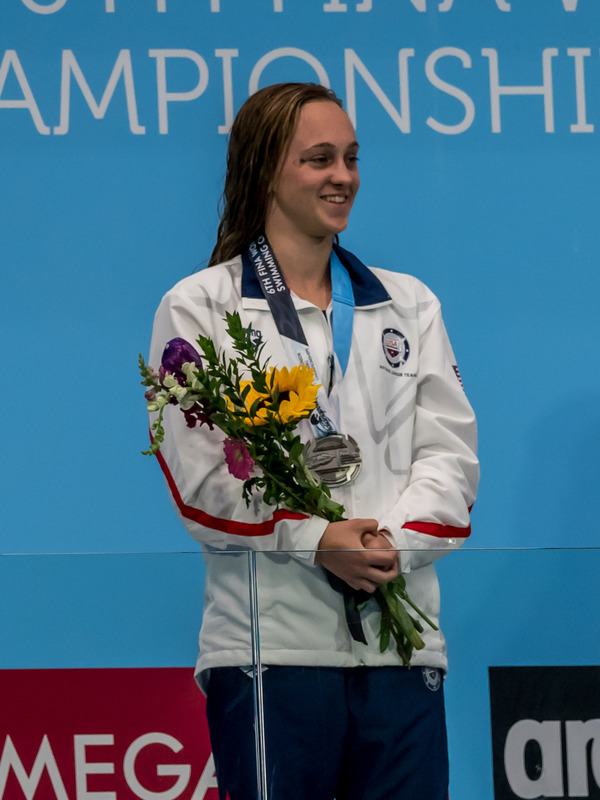 Sullivan is a truly elite distance swimmer who ranks 6th in USA Swimming history for 17-18s in the mile at age 17. She trails some serious swimming names: Ledecky, Hoff, Ziegler, Evans and Runge. Her mile would have been 3rd at NCAAs this year. If open water were an NCAA event, Sullivan would probably rank even higher. She's got a good enough 200 free to potentially be a relay factor down the road, but for now, her brilliance is a bit limited in NCAA impact compared to the top 4. In our original ranks, we praised Tankersley's thrilling range and potential impact on free relays at the NCAA level. None of that has changed, though she's been passed up for the top 200 free in the class. The only issue moving Tankersley down is that she hasn't had a great senior year. She regressed back to season-bests of 4:44/1:45.8/50.0/23.1 in the freestyles, and also failed to set personal bests in any of her top long course events over the summer of 2017. Anybody can have a down year, and Tankersley's previous progression was great, so there's no cause for panic yet. But she does slide down two spots behind some faster risers. Merrell is the great mystery of the class for now. We ranked her #1 a year ago, enthralled with her speed and versatility, which are both outstanding and perfectly aligned to the NCAA's value system. But Merrell has gone dark, without a single registered swim since August of 2017. And even last summer, she wasn't at her best, with most of her lifetime-bests coming in 2016 or earlier. Certainly, swimmers can overcome an extended break before college (we know of a guy named Caeleb Dressel who did alright after his), but the uncertainty around her status has us dropping Merrell back to 7 on our list. Muzzy had had tremendous improvement since our original ranks. She now has the best 200 back in the class (though she's lost the top 200 IM time) and is at NCAA scoring level in both the 200 back and 400 IM, and close in the 100 back. It's a deep class of backstrokers, but she's one of the best in the field. Add in her IM talent and Muzzy is a potential difference-maker with some decent relay value to boot. The range has opened up significantly for Carter, who was good at everything but not great at anything as of our last ranking. Her 200 fly has dropped more than two seconds, and isn't just in NCAA scoring range, it's within a hair of an A final time. Her 200 back has dropped to almost scoring range, as has her 200 IM. Add in a 6-second drop in the 400 IM and Carter has a plethora of potential NCAA event lineups. 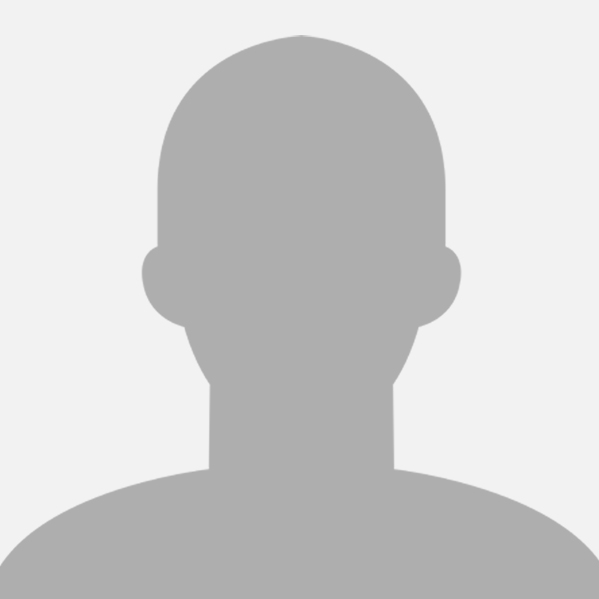 Nordmann is another fast riser who jumps into our top 10. She's cut almost two seconds off her 200 back to jump into NCAA scoring range and very nearly lead the class. Her 100 back, 100 fly, 50 free and 100 free have all cut time in the past year, but her biggest (and most impactful) improvement has come in the 200 free. She was 1:49.3 when we ranked her last spring, and has chipped 4.4 seconds off the time to become a potential elite-level relay split on the 800 free team. A total relay dominator with some of the best times in the class through her four best events. With Merrell uncertain, Fackenthal might be the best 100 flyer in the class. 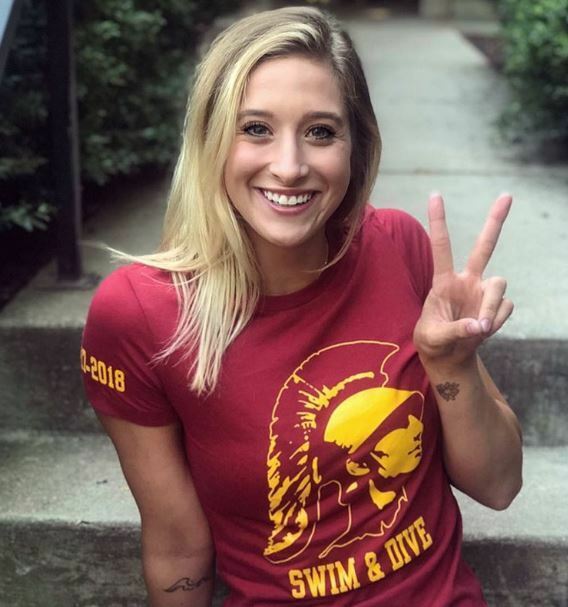 She's cut a half-second in her 50 free and seven tenths in her 100 fly since last spring, and her range is coming around after a drop of almost three seconds in the 200. Kopenski is another one of our big talents who had a rough senior year. She's got NCAA scoring times in the 500 and the mile, but wasn't anywhere near bests in anything this past season. (She's been at best 9:45/4:43/1:51). Kopenski's lifetime-bests at this point come from at least two years ago in most races. Her 500 is from 2016, her 200 from 2015, her 1000 and mile from 2014. She's still got huge talent, and perhaps a change of scenery will bring her back to top-10 status. Luther moves down, not really because she's gotten slower, but because so many others have gotten faster. She's had marginal improvements in both butterflys and the 200 free, and has a solid NCAA scoring time in the 200 fly. The wild card for Luther is that she had an amazing summer of 2017, cutting a second to 58.5 in the 100 meter fly and two seconds to 2:08.7 in the 200 meter fly. Luther could have spent her senior year gearing up more for long course and this summer's all-important selection meet, so watch for her stock to rise if she has another breakout long course season. The best pure sprinter in the class, Ariola is still far from a drop-dead type. She made small improvements in her 50 and 100 and maintains the class's best 50 free. Her sprint backstroke has improved, and Ariola has Olivia Smoliga upside as a relay threat. Also had a good summer of 2017 in long course. Shelton gets points for the best 200 free in this class, a great swim that would have been close to an A final at 2018 NCAAs. She's good enough in the 50 and 100 to have lots of relay value. She also turned some heads this spring with her toughness, swimming that 1:44.0 200 free back-to-back with a 200 IM win at her high school section meet. Lee is pretty much improving across the board, with drops in both backstrokes and both IMs, though her best events (the 200 and 500 free) have stayed pretty even with last year. Hard to see exactly where she projects, but there's great versatility there along with the ability to be a multi-relay threat. Bayer is one of the bigger names in the class, but one of the harder to rank. She's got Ruck syndrome going on where her long course bests (58.1/2:07.9 butterfly) far outstrip her short course times. But Bayer has also hit a dry spell lately for PRs in both courses, without a lifetime-best butterfly swim since the summer of 2016 and without a short course time drop in fly since 2015. Her 200 free is coming around during that stretch, though, and she's got potential to be an instant NCAA A finalist as a freshman if she returns to form. Another miler who could swim down to 800 free relay contention in the right program. There's a real argument for Homovich over Kopenski as the next distance type, and Homovich is certainly rising faster. Her 500 and 1000 have had decent drops since our original ranks. But her 200 (1:49.03) and mile (16:05) haven't been as good during her senior year, so the trajectory argument isn't quite strong enough yet. Braswell was just off our list in the last rank, and jumps up now based on a four-second improvement to her 500 free. She's got a slightly better range than Homovich down into the sprints, plus a better 400 IM, but isn't quite as good in the mile or 500. These two prospects are very much on equal footing, though. Raab falls quite a ways from last spring after going backwards in both breaststrokes, particularly the 200, where she really stood out in 2017. Raab is still probably the second-best breaststroker in the class (Pearl has passed her up, but projects more as an IMer), but the class is catching up we count about four breaststrokers in the 1:00s and/or 2:10s nipping at her heels. Still, all it takes is a moderate drop for Raab to be sub-minute, which would make her key on a lot of medley relays. She's been 1:00.6 and 2:11.5 in her senior year, which isn't bad, but a ways off her bests, which are now two and a half years old. Grinalds, the only uncommitted athlete on our list, ends up just outside the list despite very solid value. She's got great free relay range, and is only about a step away from doing what Julia Cook did over the past year and launching into the class's top tier. She just doesn't have the one standout event yet to rank in over the last few on our list. Alons is good at everything, but not great at anything yet. She is, though, in position to jump way up the list with small improvements across the board. If the class weren't so loaded with fly/back types, she'd probably crack the top 20, and she's a great value pickup with potential to be a crazy relay weapon. Like Bayer, Goeders is another swimmer who is a better long course prospect. She's been a great 24.8 in the long course 50, and has one of the better 50 yard times in the class. But the range isn't quite there yet, and a pure sprinter probably needs a 50 that's significantly better than the rest of the class, or a 100 that's more in the middle of the pack to make the top 20. Mare Nostrum Canet (Stop #1) begins tomorrow! Why are the Bears struggling to land top female swim talent recently? Am I missing something? GO BEARS! Caldwell swam for two seasons at North Carolina State University, where she was an All-American and an ACC record-breaker. As a freshman in 2015-16 she qualified for NCAAs in the 100 back and was a member of the 400 free and 400 medley relays that earned All-America honors at the 2016 NCAA Championship. She was also on the 400 free relay that won gold at 2016 ACCs with a conference record. In 2016-17, she qualified for NCAAs in the 50/100/200 free and picked up honorable mention All-America honors in the 100 free, placing 13th with 47.80. She also earned All-America honors at the 2017 NCAA Championship as part of the 200 free relay (4th place) and the 400 free relay (5th place). At 2017 ACCs she won conference titles in the 200 free relay, 400 free relay, and 400 medley relay, breaking school and meet records in both freestyle relays. Alicia's competing at this week's British Summer Championships 2018 @ Ponds Forge, Sheffield. 50m Free: *Winner* - 25.84 (converts to 22.68 in SCY) => New PB! 200m IM:*Winner* - 2:14.42 (converts to 1:57.27 in SCY) => New PB! 100m Back: *Runner-up* - 1:01.73 (converts to 53.17 in SCY) => New PB! 200m Free: *5th* - 2:03.58 (converts to 1:48.46 in SCY) => New PB! Particularly impressed by that 1.31 sec improvement in Alicia's 100m Back! 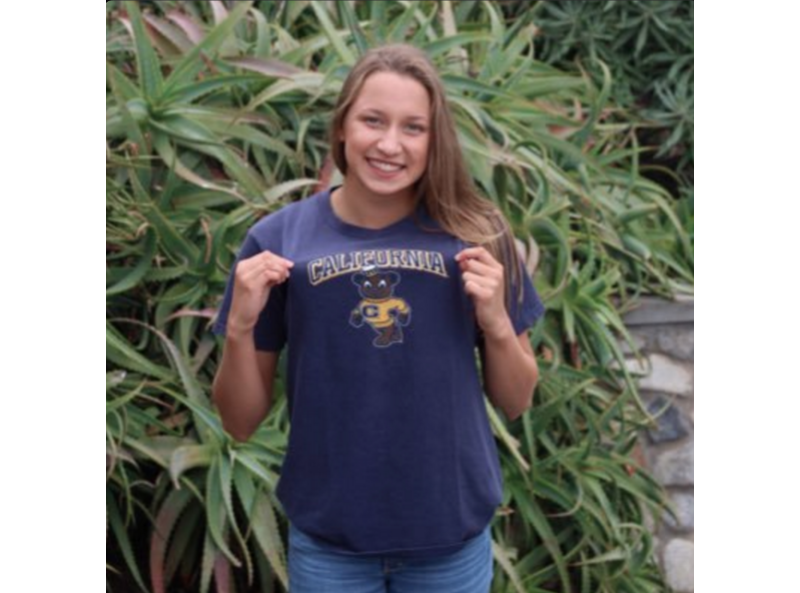 Swimming World Presents "Top 2018 High School Recruits"
Swimming World takes a look at the swimmers it considers to be the 10 best high school recruits from the Class of 2018 and where they'll be attending college in the fall. The high school Class of 2018 boasts several top recruits who should make an impact with their new teams at the college level. And many of those commits will be swimming for teams that finished among the Top 10 schools at the women's and men's NCAA Division I Championships last March. Stanford, Texas, Georgia, USC, North Carolina State, and Florida are the top schools chosen by the top female recruits, while the top male recruits will be heading off to Texas, Cal, Indiana, Florida, USC, Stanford, and Georgia. It's kind of strange to see Cal not in the top 5 classes considering what we're used to. That said, while these five new Golden Bears are all very impressive, these swimmers have yet to really develop more than 1-2 high-impact events in yards. There is definitely a lot of quality in these additions nonetheless, and the name that could really blow up is Cassidy Bayer. Bayer is an interesting case, as she's shown up in long course but has been sidelined and plagued by knee injuries the last couple of seasons. 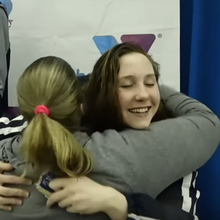 Lest we forget that Bayer at 16 was the third place finisher at the 2016 Olympic Trials in the 200 fly, AKA a first-alternate Olympian, and she wasn't far from snapping Mary T. Meagher's 15-16 NAG in the 100 fly that year, too. In yards, she's been 52.78/1:55.20, and it's the 200 fly where she really excels. The 1:55.20 would've B finaled at NCAAs this past season, and her 2:08.0 long course PR from 2015 suggests that a successful comeback from her knee problems might yield something more in the 1:53/1:54 range. A 1:46.9 PR in the 200 yard free from Bayer early in 2018 has to settle some worries about her future. Alex Sumner is in a similar boat with Bayer in that her 200 is what she hangs her hat on. Her 1:52.33 PR would've been invited to NCAAs and just off of scoring, but the backstroke improvements we've seen nationally, and more specifically the progression of depth in the events, de-value her a bit. Sumner is also a strong 400 IMer with a 4:15.08, and she might focus on an endurance-based schedule with a 200IM-400IM-200BK lineup. The American newcomers for Cal could actually form a quite nice medley relay with Sumner leading off, Ema Rajic 2nd, Bayer 3rd, and Elise Garcia holding down the anchor. Rajic is a top breaststroker, coming in with a 1:00.6 which is very good news for Cal, which has been experiencing a breaststroke drought that has gone on a bit too long for a top 3 program. Garcia, a homegrown product, slots in with a 22.6 50 free, but she's an exceptional flyer, too, with bests of 52.7/1:56.6. The final piece is British all-arounder Alicia Wilson. She has an odd string of top events, boasting a 2:14 IM, 25.8 50 free, and 1:01.7 100 back in LCM, but those could all translate nicely. Considering Sumner (2:00/4:15), Rajic (2:00/4:14) and Bayer (1:58/4:12), this class is deceptively good at IM, and if Wilson figures in with good yards times, they can improve upon how they look on paper. In my completely unbiased opinion *cough cough*, that #9 ranking by SwimSwam is massively undervaluing our 2018 frosh class. Was actually thinking that Bears were overlooked dark horses (decidedly underdogs) with a credible shot at the National Title this season. It's hard to grapple with the deafening noise that this class has. It's hard to grapple with the deafening noise that this class has. 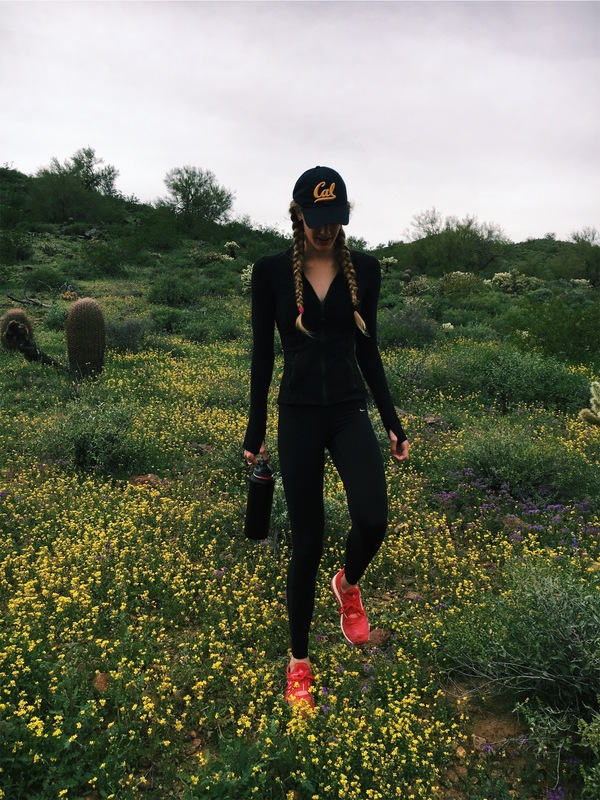 Taylor Ruck is a Canadian record holder, and her time in high school training and racing in yards makes it easy to see how she will be able to transfer from LCM to SCY. She has blown up this past year or so, and her 24.4/52.7/1:54.4 freestyle combo in LCM is absolutely lethal, not to mention her 59.1/2:06.3 in backstroke. Ruck will boost any relay she's on, and her yards bests (22.3/48.5/1:44.3 FR and 52.9/1:53.3 BK) are already impressive, but when considering they're from 2015 and earlier (save for her 50 from 2017), it's clear that she will probably be an NCAA title contender in multiple events. The freestyle talent here is insane, with Morgan Tankersley coming in at 48.6/1:44.3/4:37.6, Lucie Nordmann at 22.3/48.3/1:44.9, Amalie Fackenthal at 22.4/48.2/1:46.2, and Anya Goeders at 22.4/49.3 (and 24.8 LCM). Meanwhile, Nordmann may be better utilized as a backstroker (52.1/1:52.1 PRs), and Fackenthal a butterflyer (52.0 PR). We haven't even mentioned the best breaststroker in the class yet, Zoe Bartel, whose 58.7/2:06.2 blows away anyone else in the class, true freshman or transfer, out of the water. 1:00.0/2:09.6 breaststroker Allie Raab and two divers makes this class simply elite. The Stanford freshman class, on its own, could probably go top 3 in any relay right off the bat. While the Cardinal loses Simone Manuel and Katie Ledecky, there isn't much else you could've expected from their freshman class as they keep trekking on with another NCAA title in sight. Regardless, I'll more than happily take our 2018 Baby Bears over their tree counterparts any day, even if the #1 ranked super saplings (by a wide margin at that) are expected to lord it over the rest of the field with embarrassing ease in the 2018-2019 season. Immediate success in terms of NCAA Championship scoring isn't the most important criteria as far as I'm personally concerned - though that is of course always very welcome haha. IMO what is so massively appealing about our latest group of talented Baby Bears is that they aren't defined by just their already stellar ability in the pool - besides being excellent students with a varied mix of personalities, our swim Bears, by choosing (and being chosen by) Cal, also by extension buy into the whole philosophy & culture of the programme and of the school. Hopefully they will embrace much of what we value and love so much about the University, and in time go on to represent the school well in all facets of life, one can not ask more of or be happier for them than this, yay!